Health insurance premiums are going to skyrocket under Obamacare next year, maybe even double! No, wait -- they're only increasing a little, and less than before Obamacare! No, wait -- they're … decreasing in some places? The crucial question about the second year of enrollment on the Affordable Care Act's health insurance exchanges is: How much will coverage cost? Actual prices won't be available in most states until the exchanges open Nov. 15, or shortly before that, so consumers are left to sort through political spin and preliminary reports that don't make things any clearer. So what's going on? First, most people will pay more for health insurance next year. That's true whether you get coverage from a job, on your own through an exchange or directly from an insurer, or from Medicare. Health insurance prices tend to go up. It's their nature, and it's closely tied to how much the cost of medical care rises. The average increase for Obamacare plans will be 8.2 percent next year in 29 states and the District of Columbia where data about health insurance premiums for 2015 are available, according to PricewaterhouseCoopers, which has conducted the most thorough review to date. That's significant, but it's a little lower than the 10 percent annual rate hikes typical before the Affordable Care Act, according to a recent analysis published by the Commonwealth Fund. 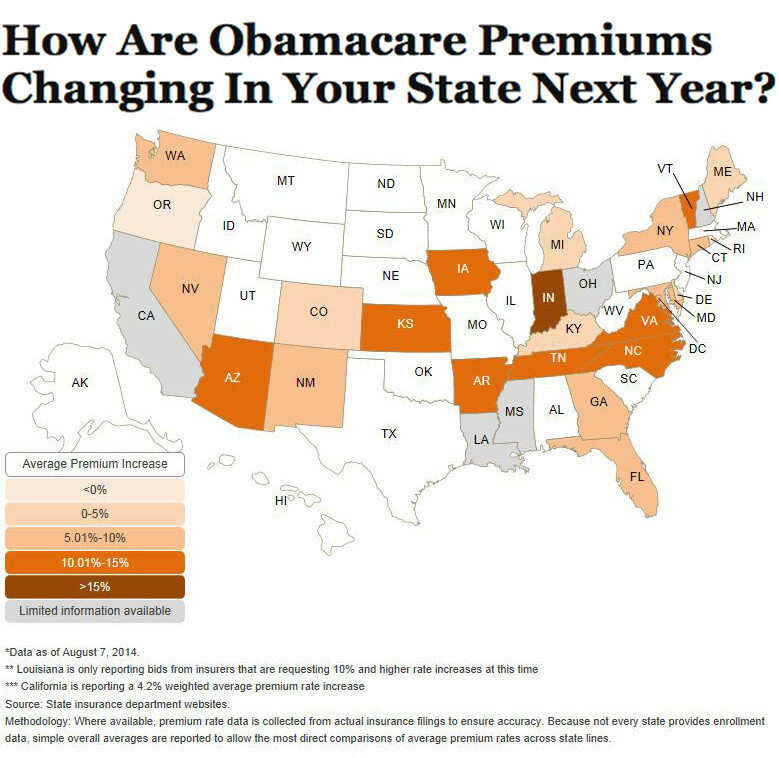 The map below shows average premium increases in the states PricewaterhouseCoopers reviewed, with darker shades indicating higher rate hikes. States with limited information are shown in gray and states where no data were available are shown in white. See an interactive version of this map from PricewaterhouseCoopers. But none of that is worth much to an individual consumer worried about her pocketbook, and it's no consolation to the family seeing rates for their coverage increase by 10 percent or more, even if that happens only to a fraction of the more than 15 million people the Henry J. Kaiser Family Foundation estimates are in this market. Averages mask a lot of variation between the states, and even within them, because rates typically are set on a local level. Also, these big-picture numbers don't account for individual variables that affect prices, like age, family size and tobacco use. There are multiple health insurance companies operating in nearly all states, and each sells numerous products to individual households, both on and off the exchanges. The plan one consumer has this year could cost 15 percent more, while her next-door neighbor may see his price go down. What's more, the numbers used by PricewaterhouseCoopers and others are preliminary in most states, meaning they could change after insurance regulators review them. Plus, states report the prices differently, making comparisons difficult. Take Florida, where the anti-Obamacare administration of Gov. Rick Scott (R) says health insurance premiums will go up 13.2 percent on average next year. The U.S. Department of Health and Human Services responded to Florida's announcement by arguing that rates for the most popular type of insurance are actually going down in the areas where three-quarters of Sunshine State Obamacare enrollees live. Similarly, in California, the health insurance exchange touted a 4.2 percent "weighted average" statewide increase, a calculation that considers the number of people on each health insurance plan, rather than a simple average of the price hikes. The state didn't release a plain average. Comparing states, there's a wide gulf between a place like Oregon, where the average rate will be 2.5 percent lower, and Indiana, where the average price is set to increase 15.4 percent, the PricewaterhouseCoopers report shows. Even within those two states, the change in premiums varies a lot -- from 20.6 percent lower to 10.6 percent higher in Oregon, and from no increase to 35 percent higher in Indiana. Rates vary this year, too, as they have in the past. The problem is, all of these numbers can be correct, but are are being placed into context by people who have an agenda. And they don't factor in the tax credits that subsidized premiums for 85 percent of the 8 million people who signed up on an exchange this year. While subsidies could shield those enrollees from higher premiums, these consumers still may have to shop around for a new, cheaper plan to keep their costs down next year. Why will health insurance premiums rise, and why does it vary so much from location to location? There are a host of reasons. Some reflect the nature of the U.S. health care system, and some are Obamacare-related. Mostly, insurance rates climb because health care costs climb, even though the growth in national health care spending has been historically slow for several years. Factors like prices for medical services and drugs and how much health care people use, vary by state and local area, for reasons that aren't always clear. Generally, premiums are lower in states where multiple insurers compete. All of this was true for 2014, and for every previous year. What about the Obamacare effect? The most important change this year is that the law required insurance companies to cover people with pre-existing conditions, which led to the expectation that they would need more health care and drive up costs. The share of young adults who enrolled is below what the Obama administration hoped, and there's evidence that previously uninsured people are getting medical care, but that doesn't seem to be leading to widespread, massive price hikes. The initial enrollment period didn't end until spring, so insurers still don't have a great idea of how much their new customers will cost them, As a result, they're making educated guesses about next year's premiums. This is one reason some companies are cutting rates or seeking big increases -- they guessed wrong last year and set prices too high or too low and want to boost enrollment next year. Increased competition in states where more insurers are joining exchanges also could keep premium increases down.